The latest global market study by Point Topic has revealed that the apparent differences in affordability of broadband services around the world highlights the stark contrast in prices -- and the resulting impact on local service adoption. Clearly, the challenge for broadband service providers and government policymakers will be to seek out ways to make broadband internet access more affordable -- as national leaders attempt to increase their market penetration and resulting economic impact. “Broadband prices can be over a thousand times higher in real terms in the poorer countries,” said Oliver Johnson, CEO at Point Topic. 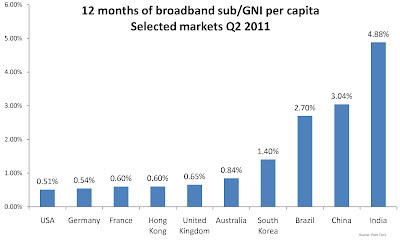 Analyzing tariff data from the middle of 2011, Point Topic has compared the cost of 12 months of subscription to the least-expensive, and usually slowest, fixed broadband service across various world markets. Converting prices to purchasing power parity (PPP) equivalents for over 2,000 tariffs from around the world and then combining the results with the gross national income per capita (GNI/capita) again at PPP rates for the relevant country allows direct comparison between the markets. The Point Topic analysis is based on data from 64 countries. “The analysis allows us to see how much of an average yearly income in each country would be needed to pay a year’s subscription for the cheapest option available. The results gap between rich and poor, the haves and have-nots in broadband terms is revealing,” said Johnson. According to Point Topic, broadband has been shifting from a luxury to a necessity -- and in some markets a human right -- over the last decade. For consumers, there have been a number of barriers to entry including education, literacy and access to equipment. But increasingly these are minimal road-blocks -- compared to the cost of a monthly service subscription. 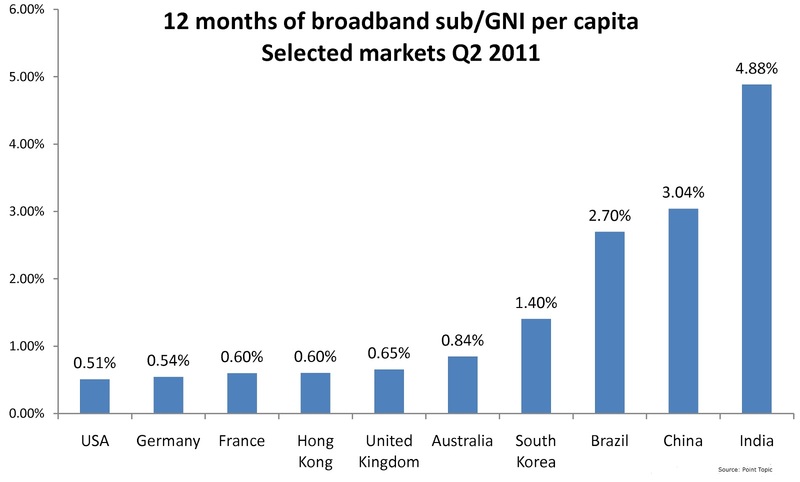 “It’s in everyone’s interest that broadband penetration keeps increasing globally. Governments gain revenue, businesses gain competitiveness and individuals get access to a wealth of benefits online. At a time when economic growth is a major challenge broadband is a great mechanism to add a percentage point or two to GDP,” said Johnson. “How this is achieved is the big question." Johnson concluded his latest global market assessment with what he considers to be the most likely outcome. Mobile and satellite are great and offer access quickly and easily where other options cannot. However, data caps and high overage costs mean they have their limits but given the high cost of fixed infrastructure deployment -- particularly outside urban areas -- they are going to be part of the mix. There really is no option but central subsidy for many markets when it comes to broadband and even the richest nations are going to have to dig deep to allow access to broadband for a hundred percent of their population.